Rajesh Kumar Banka's Maha Saraswati's page! Early Vedic references associate Saraswati with a mighty river originating in heaven and flowing down to the earth. 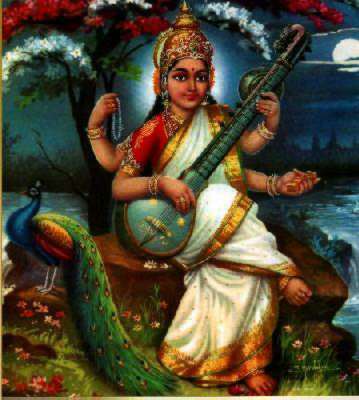 In later Hinduism, however, Saraswati's connection with a river steadily decreases and she begins to symbolize the magical power of words. "By a simple logical extension," observes A.G. Mitchell, "the sacred quality of words and speech was applied to texts and thus to learning. Saraswati, in addition to being the active power of Brahma, eventually became . . . the goddess of wisdom and learning, eloquence and the patron deity of music and the arts. Some of her names reflect these aspects of her activities; others are related to her fecundity, or her association with Brahma, which gives her the name Brahmi . . . the origins of which are obscure." Of the goddesses associated with Vishnu, Iakshmi, Saraswati and Bhudevi are the most represented ones. Saraswati is worshipped on the fifth of the bright fortnight of Magha (January-February). To all devout Hindus, she is the daughter as well as the wife of Brahma. Her other names are Satarupa, Savitri, Gayatri, and Brahmani.